National Council of Sports (NCS) is committed to get more athletes on to the presidential monthly stipend and ensure sufficient preparation for the 2010 Olympics in Tokyo, Japan. This assertion was made by NCS acting general secretary Dr Patrick Bernard Ogwel as he welcomed back the Commonwealth Half Marathon team that returned from in Cardiff, Wales having dominated the inaugural edition. 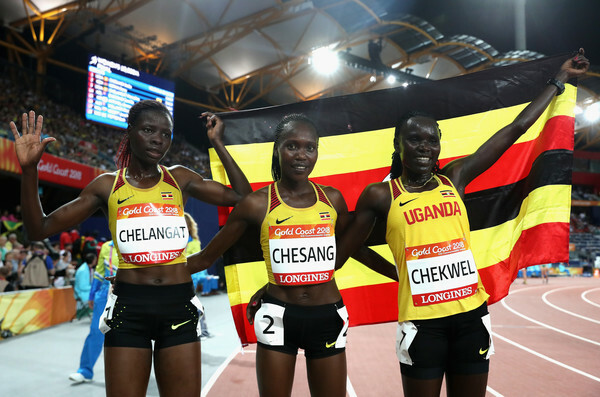 Uganda’s team of eight – four men and four women – bagged four individual medals plus two team medals – including Juliet Chekwel’s Gold. Doreen Chesang added silver while Chebet Toroitich and Emily Chebet came fourth and eight respectively to ensure the women won the Team Gold. For the men, team captain Timothy Toroitich came third to bag bronze, behind Fred Musobo’s Silver. Felix Chemonges was fifth while Vitalis Kwemoi came sixth. “As you continue to make this country proud, we commend but also promise to push for you to join the government list to receive the monthly stipend like your colleagues,” Dr. Ogwel told the team prior to a welcome luncheon held at NCS headquarters. He reiterated government’s commitment to enable Team Uganda hold a camp in the Japanese town of Tateshina, one and a half hours from the capital Tokyo, before the next Olympics in 2020. Uganda Athletics Federation (UAF) Dominic Otuchet, in his commendation speech, emphasized the need to keep winning in order to push for more funding from government. NCS paid for the air tickets of the athletes and allowances. In addition to the medals, Chekwel won Shs28m, Chesang got Shs14m, the same amount bagged by Musobo whereas Toroitich got Sh4.7m.